Dragons coach Darren Edwards insists he has the backing of the board after the region's latest defeat in the Pro 12 League. The Welsh region remain second from bottom in spite of their losing bonus point in the 26-19 loss to Leinster. They have won just five times in the league this season, and went down to a record 60-3 defeat to Glasgow in their previous home game. But Edwards pledged: "I'm still here so I've got the backing (of the board)." 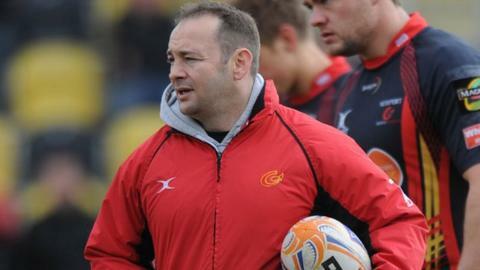 The coaching team faced fierce criticism after the loss to Glasgow and last week's 14-13 win against bottom team Zebre. However, Edwards says he gets all his motivation from within. "I put pressure on myself every week but the fight is always going to be there," he said. "We are going to strengthen the squad [next season] and the main strengthening is to put a spine of experienced players in there to help some of these young players along." The Dragons put up a spirited battle against title-chasing Leinster, but never really recovered from a poor start which saw them 12-3 down inside 10 minutes. "There was a tidal wave against us in the first 15 minutes," said Edwards. "Leinster played very well and then we had a harsh yellow card against us, but the character of some of the young players was outstanding." Leinster coach Joe Schmidt said: "I'm probably a little less than satisfied with the performance but delighted with the result. "I think our guys thought the job was done [early] and the Dragons proved it was anything but done."